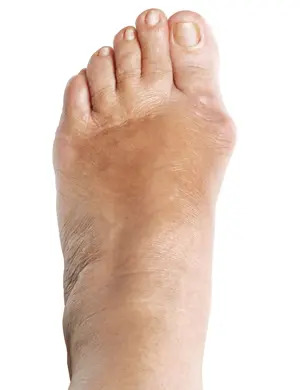 Bunions refer to the deviation of the big toe towards the middle of the foot and the lump that results on the inside of the foot. Pain & Inflammation: Because of shoes being tight or ill-fitting, this can cause pressure on the outside of the joint. Pain can also come from degeneration within the joint or due to the movement of bones around the joint. Referred Deformity: The bunion can cause other toes to lift or “claw” resulting in “claw toes”, “hammer toes” or “retracted toes”. It can also damage the ligaments supporting these joints. The treatment of bunions is a specialty at Performance Podiatry Treatment is individually tailored to the patient but can include advice on muscle strengthening, footwear, stretching, padding to redistribute weight, and orthotics to control the way the foot functions. Female patients need not fear as we will not chastise you for your shoe choices! Education on foot care will be provided so you can make an informed decision. We know that it is not always possible, especially in a corporate environment, to adhere to gold standard shoe decisions. We will do our best to fit in with your needs. Surgery is the last resort for bunion treatment. After all conservative efforts have been made. Where the bunion cannot be made comfortable in this way, it may be time to consider surgery. We will advise you of the best options and under care and guidance, you may be referred to a Foot and Ankle Surgeon.